An explanation of how the author derived a better notation for 53-E.T. from the practical experience of tuning stringed instruments in Just Intonation. The necessity of an organised efficient procedure in tuning by Harmonics led to the conception of a “field-map” which became the seed-bed for the new pitch notation and its functional counterpart. 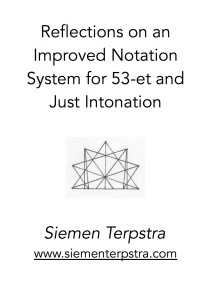 This entry was posted in 53-et, Just Intonation, Notation on 1 December 2014 by Siemen. The author responds to the article “Just Inton(ot)ation,” written by Paul Rapoport and published in 1/1, Volume 7, Number 1 (September 1991). 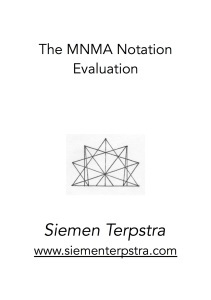 I was asked to evaluate 37 notation proposals by the committee of the MNMA. I examined all the proposals and gave their strong and weak points. Then I chose the six best and further narrowed it down to two alternatives. It was published by the MNMA in 1999. 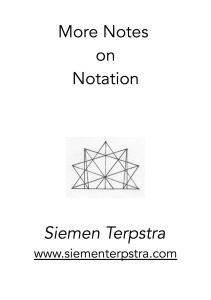 This entry was posted in 12-et, Keyboard, Notation on 1 December 2014 by Siemen.